WOLVERHAMPTON slipped to a 52-38 defeat at Poole on their return to action following the World Cup break. 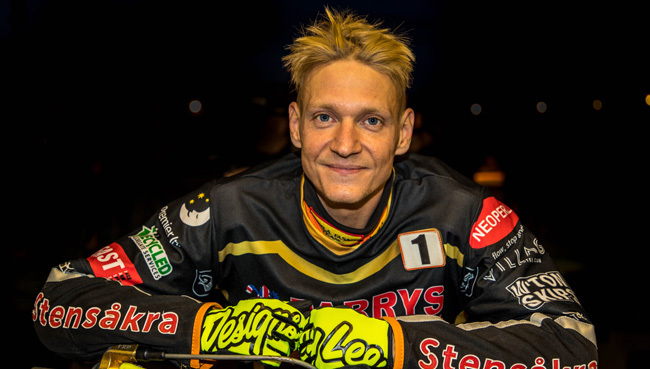 The Parrys International Wolves put in a battling display in Dorset and were in contention for a consolation point for the majority of the meeting. But the powerful Pirates came on strong in the closing stages to ensure Peter Adams’ side left empty handed. Team boss Adams admitted the late withdrawal of Joonas Kylmakorpi due to illness proved costly against a solid all-around Poole side. Said Adams: “It’s always an uphill battle here at Poole, and you have to have the whole team firing if you’re going to get a result. Freddie Lindgren top scored for the visitors with a strong showing in the No.1 spot, whilst Sam Masters also recorded two impressive race wins early on. They received solid support from Jacob Thorssell and Kyle Howarth, who both put in determined performances and claimed a race win apiece. However, Peter Karlsson worked hard for little reward, whilst guest Rory Schlein and reserve Max Clegg struggled to make an impact. Wolves will return to action as they host table-topping Belle Vue in a mouth-watering clash at Monmore Green on Monday (7.30). POOLE 52: Chris Holder 13+1, Adam Ellis 9, Krzysztof Buczkowski 8, Hans Andersen 7+2, Kyle Newman 6, Charles Wright 5+2, Brady Kurtz 4+1. WOLVERHAMPTON 38: Freddie Lindgren 11, Sam Masters 8, Kyle Howarth 7, Jacob Thorssell 6+1, Peter Karlsson 4+1, Rory Schlein 2, Max Clegg 0.